Cytech Mobile is proud to support AgileCrete this year once more. Cytech is not only a sponsor to the #AgileCrete 2017 but its team participates at the unconference too. #AgileCrete will be held from July 13th to 15th 2017 on the mediterranean island of Crete, in Heraklion. AgileCrete is an Open Space unconference that connects agile software development professionals from all over the world. It’s the playground where coaches and development team members gather for the sake of exchanging and challenging ideas about all things agile. Find more information here! “After all these years it’s a tradition for Cytech to be part of AgileCrete . We are active in the agile landscape for more than 6 years and it is the least we can do to support such events. AgileCrete is not only about agile but it is also an open space unconference. The combination of these two elements makes it unique and an event you don’t want to miss.” stated Mr. Vagelis Antoniadis, CEO and co-founder of Cytech Mobile. It is named as unconference since it is a participant-driven meeting. In other words: the event starts with an empty schedule, the participants decide the topics that will be discussed and they create the agenda by exchanging and challenging ideas about all things agile. During the unconference, depending on harvests and ideas, sessions might be merged, created or canceled. 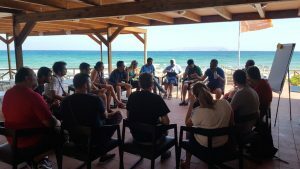 The unique feature of #AgileCrete is that participants can extend the sessions into the afternoon excursions around the beautiful mediterranean island of Crete, and close the days with a big feast with delicious local food. Cytech Mobile is an established solutions provider with an international client base and over 15 years of experience in mobile, allowing it to translate constantly changing needs to emerging technology. It is a one stop shop, with in-house built mobile solutions, including Core Business Software packages around mobile messaging, marketing and payments for Carriers, Service Providers, Content Providers and Advertising Agencies, as well as mobile marketing services for SMEs.